My Zojirushi rice cooker review is based on five years of experience with this wonderful appliance. I use it once or twice a week! Five years ago, a bunch of readers shared their love of the Zojirushi rice cooker. Because I didn’t want to buy yet another kitchen appliance, I approached Zojirushi and requested what I thought was a $40 rice cooker. My rice cooker at the time, a $15 model from Walgreens, had never made anything but soggy rice so I had decided that rice cookers didn’t work. I can tell you now that I was very wrong. A couple of weeks later after my request, this lovely rice cooker showed up on my doorstep. It is ridiculously easy to use. 1. Measure and rinse your rice (measuring cup provided). 3. 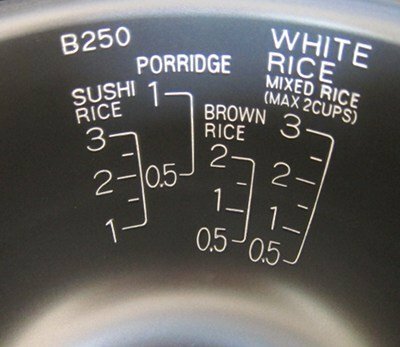 Choose the “Brown Rice” setting. 4. Wait for one hour and 40 minutes to have perfectly cooked brown rice. Oh, I forgot, you need to plug in the machine. The brown rice was easily the best that I have ever had and I found myself shoveling it in my mouth without even any salt on it. This is a find! Brown basmati from California, India, or Pakistan is the best choice; it has about a third less inorganic arsenic than other brown rices. Brown basmati is my very favorite! You can also rinse your rice thoroughly to help cut the arsenic levels. Check out this article: How Much Arsenic is in Your Rice?. After making wonderful rice, I checked Amazon.com to see what link I should post to this amazing product (see below) and found that Zojirushi had sent me a $130 rice cooker. OMG! No wonder it was such a gem. This is a Japanese rice cooker, folks. This type of cooker is essential in most Asian kitchens and if you cook a lot of rice, you need to check it out. The one they sent me is a 3 cup version which is perfect for 2-4 people. You can program it to finish cooking at any time. I set mine up at 8 AM and programmed it to be done at 6 PM so when I walked in the door, my rice was done. You can also “cook” in your rice cooker (not unlike a crock pot). 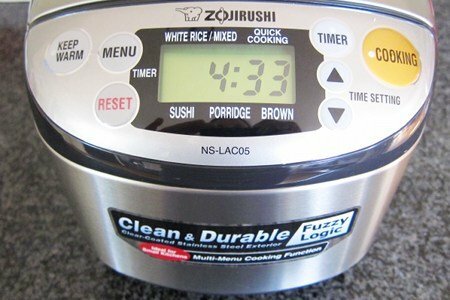 Check out this recipe page – Zogirushi Rice Cooker Recipes. It makes wild rice, and steel-cut oats, quinoa, sushi rice, and white rice. There is a recipe for Baked “Mac and Cheese” Style Brown Rice that may help me get my son to eat brown rice (he only likes white rice). I make my Crockpot Oatmeal with Old Fashioned oats but I could also make my oats in this cooker if I wanted to give it a whirl. I have stuck to white and brown rice but it is such a great machine, I may someday want to branch out. Anyway, I would never have spent $130 on a rice cooker because I am too cheap. Now that I have one, I realize that it is going to save me time, the rice is amazing, and I like using it. Go figure. 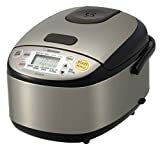 Do any of you have a top end rice cooker? Please share. I can't imagine spending that much $ on a rice cooker, but I'm sure it's amazing. I still and will always cook brown rice the way you taught me too :) Perfect every time! I usually throw in some frozen veggies and/or leafy greens (e.g., kale pieces or mixed greens that are too old for a salad) to bump up the nutrition value. A complaint I have about the one we own is that the printing on the side is almost invisible (I drooled when I looked at that nice, contrasty print on your Zoji!). But I suppose that's neither here nor there because I usually just use 1.5:1 water:quinoa (or rice) and for beans, I just fill the pot with water to within an inch or two of the top and slow-cook them for 4-5 hours, draining the results if needed. Heck, our rice cooker is so foolproof that I just bought one for my in-college-and-doesn't-know-how-to-cook nephew since he got so excited about it when I told him how easy it was to use. I just put mine in my $40 crock pot and use chicken or vegatable stock along with the water. I'm a total gadget person and find myself wanting the 132$ model but - I must resist! I do not- but now I want one! LOL I have a rice cooker/steamer but not as streamlines as this one!! I just realized the exterior and controls look an awful lot like my Zojirushi bread maker....which I also LOVE! Check out the Instant Pot 6 in 1 cooker. Electric pressure cooker, rice cooker, etc. It's a bit cheaper and does so much more. This appliance changed my life! I can have delicious brown rice in < 30 min! I have a Zojirushi Fuzzy Logic model and it has changed my life for the better! I especially love the timer function- I can have great brown rice ready and waiting when it is time for dinner. It is SO nice to catch the aroma of rice cooking and know that dinner is half done! I use organic brown rice and toss in a spoonful or so of coconut oil- it makes the pan easier to wash and tastes so good! Love this appliance- well worth the money! @Andy - Tell me more about using a rice cooker with beans, Lentils, quinoa, and veggies! I would love to prep most of the food on Sunday for the week. I think that would help with the bad choices. The issue is dry beans take a while and by the time they are done and ready to be added to other dishes, I am tired and resting in my recliner :) Don't think I would pay that much for a rice cooker. Lisa, this was a very helpful posting. I did not ever think of putting vegetables, etc. with the rice in the cooker. Our cooker is not so fancy, but very reliable. I always find something interesting and delicious in your posts! Keep on cooking and writing please! I have the NP-HBC10 5 1/2 cup Zojirushi . I never thought that a machine could make cooking this easy. I have used it to make steel cut oats , wild rice soup , pasta soup , and all kinds of rice dishes with fresh or dried ingredients and brown rice to perfection . I use it 3 to 4 times a week and I love it. It fits my life style to a T. It makes real food cooking a breeze. I have a Tiger brand rice cooker. Same price range Snack Girl....the rice is not comparable to rice cook in a pot at all. The rice out of Japanese rice cooker is fantastic! Even all my Chinese friends use the Tiger brand ( I am sure the one above is just as good)! @Leandra- I make this stuff when I have time, stash it, and then work my way through it. I think people who [heart] the smaller rice cookers are engaging in just-in-time cooking and I would rather always have a bunch of stuff from which to choose in the fridge than to have to prepare one meal at a time and wait 30-60 minutes for it. For each of these items, I usually make two cups dry so I can store a few days' worth in the fridge. I figure if I'm going to the trouble of making and cleaning, I might as well be efficient. - small beans: Same as lentils. Soak if you want, but I don't. - large beans (e.g., black beans, lima beans): Same as small beans, but soak for 6+ hours, drain the soaking liquid, rinse well, and then follow small-bean directions. - quinoa: If not pre-rinsed (e.g., red quinoa), rinse it or it will have a bitter taste. 2 cups quinoa to 3 cups of water. I almost always add frozen veggies, sometimes rosemary. Hit the white-rice button and give it a stir when done. Personally, I'm okay with the light scorching that occurs, so I just mix that layer in to the rest. If you're not, then just gently scoop the results into your storage containers and toss the scorched part. - brown rice/black rice: Rinse, drain, and use same ratio as quinoa. Use brown-rice button (which, if I understand correctly, simply adds time for soaking). - I've never cooked veggies by themselves, but I suspect you could saute them using the white-rice setting. One Mason jar of quinoa + veggies, black beans (or whatever beans you have prepared), healthy salsa or healthy pasta sauce, stir, heat, and eat! Fast and yummy! > Don't think I would pay that much for a rice cooker. Knowing what I know now about them, I would definitely pay that much for one with a stainless-steel pot, but I can see where others may hesitate. I have a stainless steel rice cooker. I didn't pay for mine either, but I believe it retails for around $70. It too, makes the best rice ever, and without the nasty teflon like non-stick rice cookers have. It also cooks and steams, although I don't use those functions. I love my Zojirushi rice maker and have been using it for two years. Never again will we make rice on the stove with it boiling over and sometimes not cooked all the way or too soft. Mine is silver and looks nice on the counter top as well and cleaning it takes about 1 minute. I would highly recommend getting one. rinse thoroughly your rice. put in a rounded deep pyrex or similar such bowl, add two table spoons of your favorite oil (olive, etc) and cook uncovered for 3 minutes. take out, mix well and add boiling water for about two fingers above rice surface. add salt and such, add frozen corn or cubed carrots or both. cover in nylon and puncture fine whole with your knife. put back in your microwave and cook for 16-17 minutes for two or three cups of rice. take out, leave for 5 minutes, mix and taste. if you feel that it is not done yet for some reason, add a few table spoons of water and cook for another few minutes. i have been cooking my rice for many years that way and the results are always perfect. I treated myself to the 5.5 cup model (not stainless, that's extra $$$) mainly because I could not make brown rice no matter how I tried. This machine is the best thing EVER! All rice comes out perfect but especially brown. I'm totally in love with Lundberg short-grain brown rice. BTW, you don't have to rinse your rice. The Japanese directions are a bit confusing so unless you're doing a specialty rice where rinsing is absolutely necessary, you can skip this step. I also do the 1:2 ratio of rice to water. The Z is well worth the money. A friend recommended it to me and she's had her Z for many many years. The quality is top-notch. SG: Have you heard anything about brown rice and higher arsenic levels? re not rinsing. i will not touch rice that has not been rinsed at least three times until clear, it has an odor otherwise. i watch Korean movies and they thoroughly rinse their rice. so i would not recommend not rinsing. Check out Jeff Novik, MS, RD site. He has a newsletter archive that addresses arsenic in rice and apple juice. Yes, I have the exact model. At first I thought it was a splurge item but now I wouldn't live without it. The best brown rice, sushi rice and steel cut oats you will ever taste. There are great books out there with tons of innovative recipes. Save up your pennies and go for it. I agree with the others who are pro-rinsing re: rice. have good info about arsenic and, IMO, the very least I can do to minimize my exposure is to rinse my rice. Mine is a 10 cup Zojirushi rice cooker with out all of the electronics. It is like a slow cooker only faster. I prepare many many kinds of meals in this thing. This one replaced the 6 cup Zojirushi rice cooker I wore out. I got the bigger one so I could do a whole chicken in the pot. The Zojirushi rice cooker, Vitamin blender and my toaster oven are my go to kitchen appliances. Civilization is just not the same without them. I have a Zojirushi induction model, and it's fantastic. You can do more than just cook incredible rice in a rice cooker. I cook perfect brown rice in my black and decker steamer...it's wicked old but it works great! I hate cooking it on the stove. Your rice cooker looks great ! I have an AROMA rice cooker from Sears(?) - use it at least 3 times a week and have rice for dinner and lunches. Often add veggies toward the end of cooking. It is always great! Less than $30.00 too!! Various brands make such tasty frozen brown rice that I probably wouldn't invest in a rice cooker. We have a lovely big rice cooker. My hubby did a lot of research into good ones after Roger Ebert wrote about them. Ours is a panasonic with a very large capacity. No idea how much money, but I'm expecting it was more than the smaller one you have. Ours has a steamer basket in it so you can also steam vegetables like squash and others. We have made spanish rice dishes as well as quinoa and other grains besides just rice. There's a bit of a learning curve with other foods, but once you've adjusted yourself to the needs of the food it's totally repeatable and bullet proof. Very pleased with our rice cooker purchase. Another item we're getting tons of use out of is our Shun mandolin. Very very high quality, far better than any plastic gizmo at a big box store. So great for julienning tons of veg for a stir fry, making french fries and potato chips, slicing veg for salads..awesome. And of course our Vitamix blender.. That thing is a beast, it takes up a lot of space, but we use it almost daily for smoothies and sauces. Of course, these widgets are so specialty they don't really go in the dishwasher all that well, so we're doing more hand washing, but they're so good at the tasks they do it's definitely worth it. It appears, that white basmati rice contains the least amount of arsenic regardless of where it is grown. In summary, all rice contains some arsenic, brown contains the most. To rid rice of at least 30% of the arsenic, one has to wash the rice, cook one cup in 6 cups of water and drain off the excess water. So rinsing does not rid the rice of arsenic only rinsing and cooking the rice in excessive water can reduce the arsenic and only by 30%. I have this same model and I love it! There are all sorts of rice type grains I cook in it and they have always come out perfect. Grains such as Quiana Barley, buckwheat, orzo etc. Trader Joe's sells a bunch of different rice blends and medleys that work great in this machine. I especially love that I can cook rice and not heat up my whole kitchen in the dog days of summer. The rice cooker looks awesome. We go through a lot of rice, so I'll have to check it out. And to weigh in on the discussion on rinsing, I've done it both ways and don't notice much of a taste difference. The texture is hugely different though--I get a sticky mess if I don't rinse it at least twice. All rice needs to be washed thoroughly. Brown rice has the most arsenic because the aresenic is collected in the brown rice hull. Basmati rice is said to have the least. "On September 6, 2013, FDA released the results of approximately 1,300 samples of rice and rice products examined for the presence of arsenic.
. . . found average levels of inorganic arsenic for the various rice and rice products of 0.1 to 7.2 micrograms of inorganic arsenic per serving. . . . For example, one serving of non-Basmati rice is equal to one cup cooked, whereas one serving of a rice-based snack bar may contain only ¼ cup of rice." The FDA tests for organic and inorganic arsenic. I received a Zojirushi induction fuzzy logic rice cooker from my generous husband, and it has converted me. Not only is it simple to use, but the results are fabulous! I've made brown rice, wild rice, quinoa, rolled oatmeal, steel cut oatmeal, macaroni and cheese, farro, and more. What a joy to use, a snap to clean, and it looks so cute on my counter! I find myself looking for recipes that I can cook in this little gem. The price may put some people off, but I expect I'll own and use this for the rest of my life, and eat more healthy meals as a result. Two thumbs up! I have that rice cooker and love it. It works well for all styles of rice and oats and is worth every penny! We use it each week. i absolutely love my zojirushi fuzzy logic rice cooker. it is one of the few pieces that i keep out and use all.year.long. does each of the items above perfectly every time. so much so, that i have absolutely no interest in purchasing an instant pot. I want a rice cooker. I'm shopping around for one now - will check out Amazon. Yums! We had read in Consumer Reports that to reduce the arsenic in your rice you should cook it with extra water and then, when the rice is cooked, drain out what is left in the bottom of the pot. Supposedly, more of the arsenic will be leached out of the rice that way. Do you think this rice cooker could work like that - where you add extra water and it is not all absorbed by the rice?